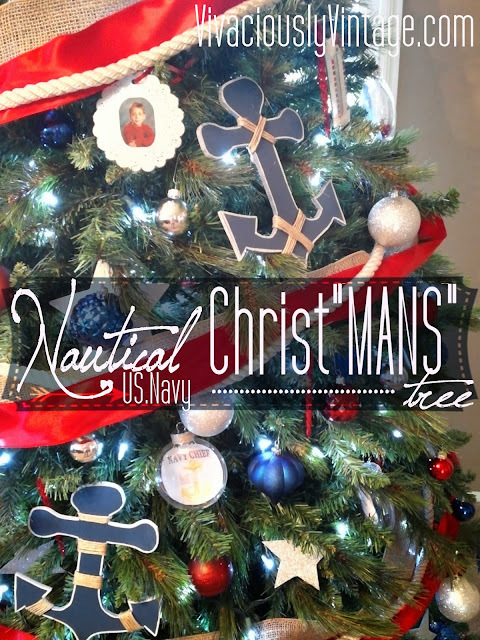 Ansley Designs: Nautical Christ"mans" Tree! I picked up the tree itself at Goodwill for only $18. It's actually a really nice, thick tree. The lights didn't work, but just like with our peacock Christmas tree, kiddo and I cut out all of the "pre-lit" lights and just added some string ones. I used some rope we had in the garage, burlap and red ribbon for the tree's garland. 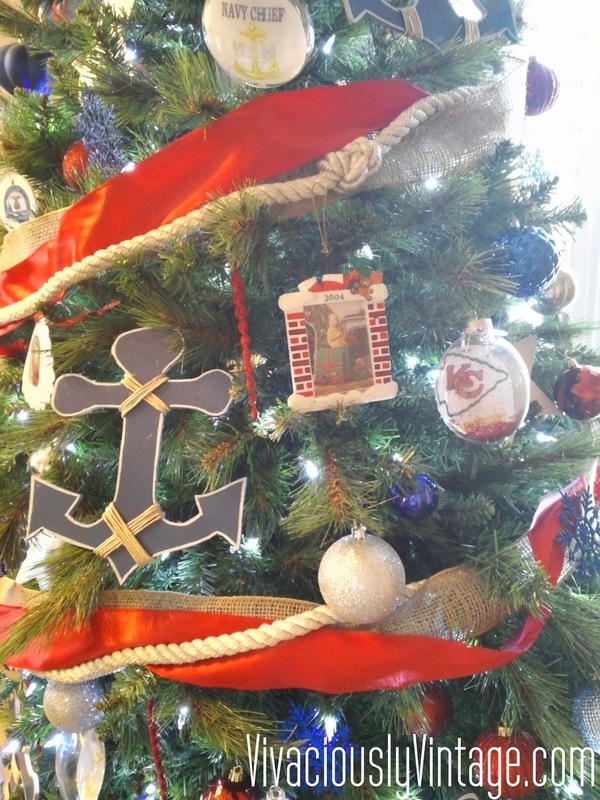 I also made all of the Christ"mans" ornaments myself: the large anchors and the clear ornaments with his favorite sports teams. I'll post a how to on those soon. Overall his Christmas tree has a nautical theme (I do confess to wanting one of these for myself). I was also sure to add other touches that have to do with him. 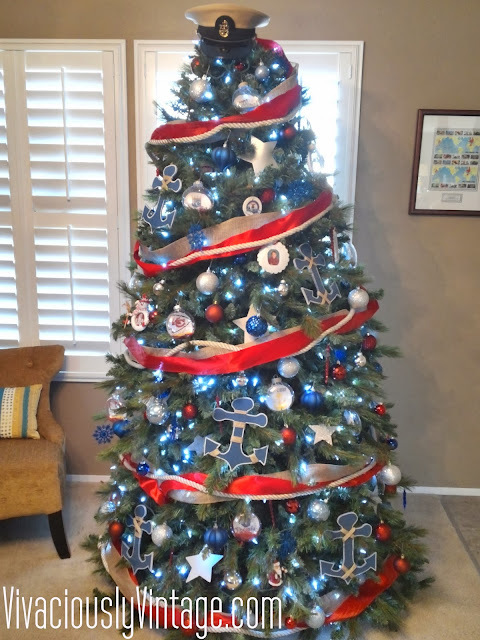 I mentioned the ornaments I made with his favorite teams: Kansas City Chiefs and Royals. He's lucky they match the tree's colors; otherwise, I probably wouldn't have used them! lol Along with his sports teams are some hints of the Navy. 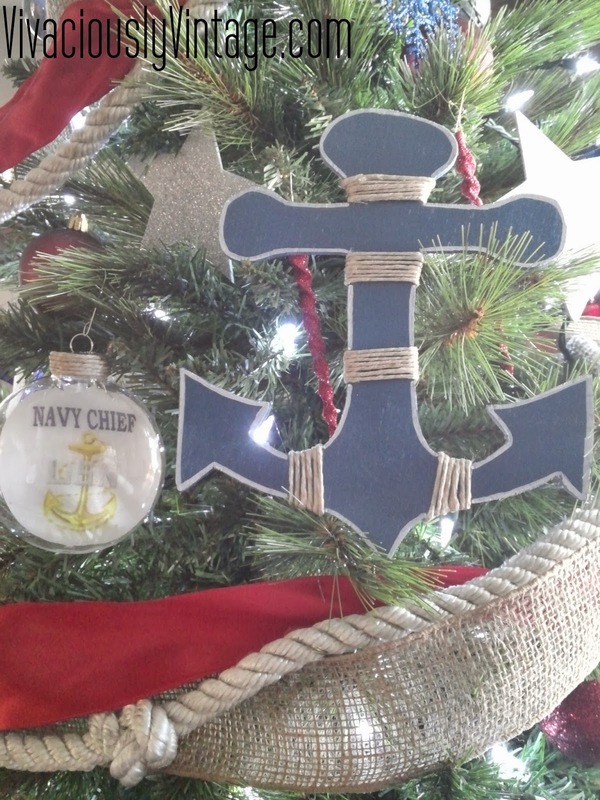 I also made some of those clear ornaments that say "Navy Chief", which is his rank...and I also think it's funny that his favorite team is the Chiefs! 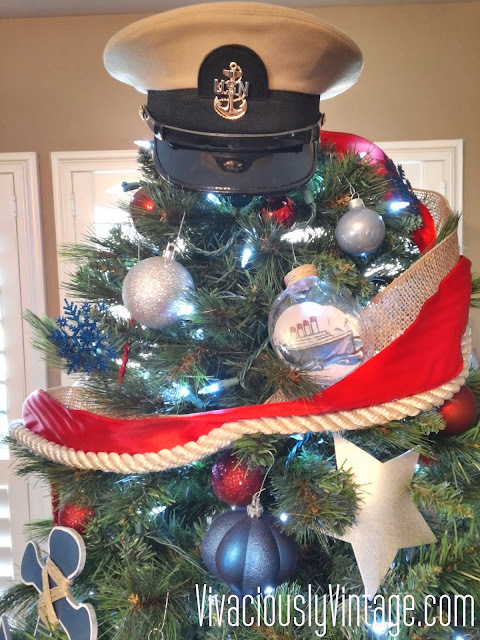 His cover currently adorns the top of the Christmas tree, but I'm thinking of making something else for a topper...I think it needs more height! 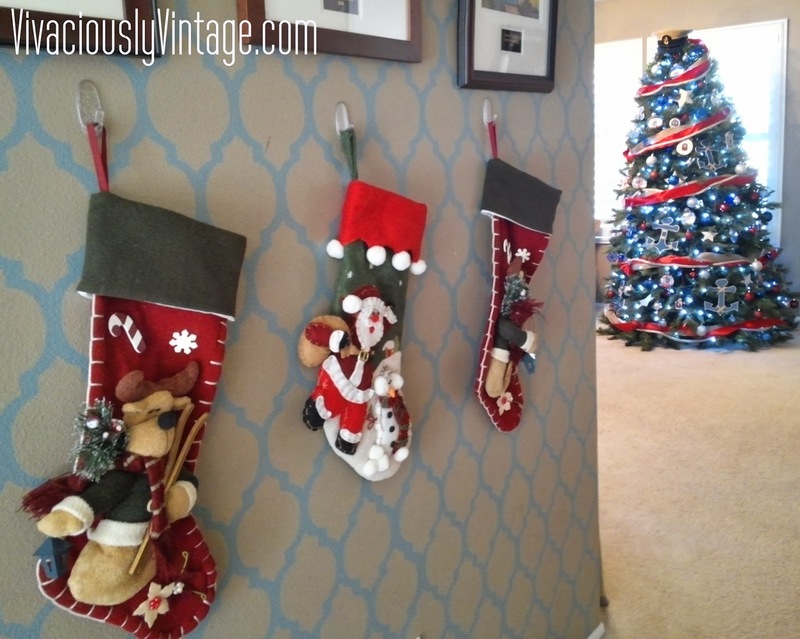 I've always loved this view of the stockings lined up and the Christmas tree behind them. I'm still hanging on to these stockings. I bought them the first year Jeremy and I were together. I have a second Santa Claus one because I was so sure we'd need it for another kiddo. Been waiting almost 5 years now. 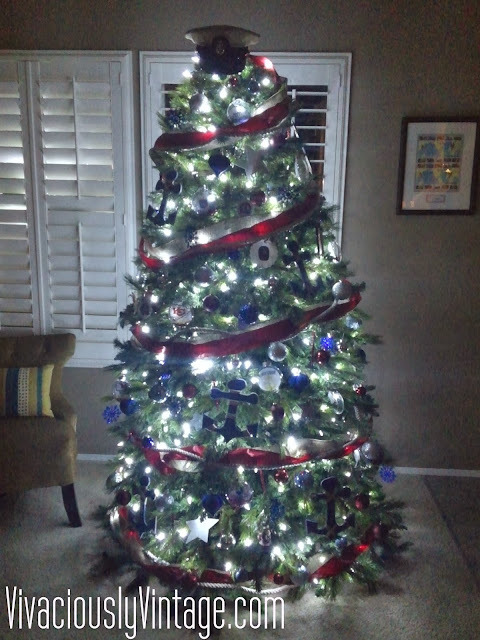 I went with the "cool white" lights for this Christmas tree, mainly because I've switched all of our outside lights to that color.... and this is the tree that can been seen from the front of the house. I like how during the day they have a blue look to them, which matches the tree. Of course at night they are spectacular! This is my first time ever to have 2 Christmas trees. I'm honestly looking forward to next year when I can just decorate them and not have to worry with making/buying ornaments! Sadly, I think I'm addicted now...so there might just be a 3rd tree next year!!! How many Christmas trees are in your home?